ProArgi-9 dietary supplement with its' ultra high grade L-Arginine is causing a stir in the sports and bodybuilding community. Already hugely popular amongst the general population due to its' cardiovascular benefits ProArgi-9 is now making headlines as a safe builder of protein and nitric oxide for enhanced athletic performance. In complete contrast to many of the dangerous or, at best, questionable bodybuilding and athletic supplements on the market is rapidly gaining a reputation as one of the good guys. This is a pure supplement that offers many benefits, not just to footballers and athletes, but also to people of in all walks of life that are looking for many additional benefits. Added to the protein benefits there are three other important reasons that athletes such as footballers choose to take ProArgi-9. The first reason relates to L-Arginines' role as a precursor for nitric oxide production that promotes optimal blood circulation. This heightens its' popularity with athletes as good blood circulation ensures the speedy distribution of nutrients the muscles. One of the major trends in sports nutrition in recent years has been the demand for high grade L-Arginine products that increase vascularity, or vein visibility, and blood flow resulting in what is often referred to as the 'pump'. The second reason that sports people use ProArgi-9 is its' role as in Creatine synthesis that helps to supply energy to the muscles. Along with the amino acids methionine and glycine, L-Arginine is a component in one of the best known sports nutrition ingredients . The third reason that ProArgi-9 is popular with athletes is its' ability to increase natural growth hormone production. Amongst other functions growth hormone has anabolic effects in the muscle that helps to increase and maintain lean muscle mass while also decreasing fat mass. ProArgi-9 also helps to build the immune system, improves recovery time following injury, controls free radicals, supports healthy cholesterol and, helps in fat metabolism. ProArgi-9 is a truly powerful supplement that has been successfully used by athletes and sports people throughout the world to safely and legally enhance their performance. ProArgi-9 is legal for use by players in the Premiership, athletes at the Olympics, Ironman competitions, WPF power lifting events, and NFL and NBA events. ProArgi-9 is labelled in English and German to meet the food safety regulations of both the European Union and the individual food regulations of every EU country. The recommendation on the label is to take 1/3 scoop per day. This is the lowest common denominator that will comply with all EU and each individual country's food regulations. In reality the ProArgi-9 is a food supplement (hence the reason there is no VAT on the product). Unlike a medicine, it is NOT possible to overdose on a food supplement. The body uses it what it wants and excretes excretes anything surplus to requirements. All of the official tests have been based upon four level scoops per day. 2) first thing in the morning, at least one hour before breakfast (and that includes orange juice, tea, coffee etc. Sports people and athletes should take ProArgi-9 fifteen to 20 before you begin exercising. This will significantly increase your energy levels and reduce muscle recovery times. ProArgi-9 should be mixed with a minimum of 120mls cold water. Stirring vigorously until all of the powder has dissolved. ProArgi-9 should not be mixed with warm or hot water or made into a tea as this reduces the effectiveness of the amino acids. ProArgi-9 should not be taken by people aged 22 or less. Please note that ProArgi-9 contains a natural sweetener called Xilitol for flavouring purposes. In rare cases this may cause mild diarrhoea. If this occurs to you then you should cease use of the product until the symptoms disappear. Then resume daily use of ProArgi-9 at a lower dosage and gradually increase the dose to your desired level. 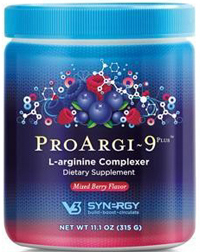 Why is ProArgi-9 Better than other L-Arginine Products? Is ProArgi-9 accepted for use by Athletes by Official Sporting Bodies? Yes. Athletes using ProArgi-9 Plus have won Gold medals ProArgi-9 Plus is used and promoted by famous world-class athletes who have used ProArgi-9 Plus during their careers and in their competition events. ProArgi-9 Plus is legal for use in Olympic games, IFBB world body building competitions, FA Premier League, WPF power lifting events, NFL and NBA events and many other top professional events. After a rigorous review by the World Anti-Doping Agency (WADA) none of the ingredients contained in ProArgi-9 have been found to violate the WADA compliance standards. As a result, this product is a safe, legal, and hugely beneficial addition to the diet of high-level competitors concerned with avoiding substances that have been banned by WADA. During manufacture, quality assurance procedures are followed to ensure that ProArgi-9 is protected against adulteration, that label ingredient claims are met, and that the finished products and ingredients are free of athletic substances. No. Other amino acids may not be ingested simultaneously with ProArgi-9 Plus and that includes protein and amino acid supplements and foods or drinks containing protein and/or amino acids. The reason for this is that other amino acids compete with L-Arginine and can render the formula inert. Other amino acid supplements, foods or drinks ~ be ingested two hours before or after taking ProArgi-9 Plus. So remember, athletes that take their protein shakes with their arginine supplements are wasting their time and money. How Much Does ProArgi-9 Cost? A month's supply of ProArgi-9 costs €65. This works out at just over €2 per day, or the price of a daily newspaper. To order your supply of ProArgi-9 today please email proargi@soccer-ireland.com. Postage is free to anywhere in Ireland and your supply will be dispatched upon receipt of cleared funds. If you choose to pay by credit card (via PayPal) your order will be dispatched within one working day.